NATO member-states unwilling or unable to help boost the military spending are being accused of ignoring the “Russian threat,” that has re-emerged as the core of the alliance’s agenda to boost arms sales. A report saying one of major NATO funding contributors, the UK, could fail to fulfil the commitment to spend 2 percent of its GDP on the alliance in 2015 came as a bombshell for some of the West’s military elite. The head of the US army, General Raymond Odierno, told the Telegraph he was “very concerned” about Britain’s possible defense cuts. “[Odierno] warned that, while the US was willing to provide leadership in tackling future threats, such as Russia and ISIL [the Islamic State, aka IS or ISIS], it was essential that allies such as Britain played their part,” the British daily wrote. “The level of threat posed by Moscow has increased and we have to be prepared to take the defensive measures necessary to defend ourselves, defend our allies - which now extend as far as the Baltic States and Central Europe,” Sawers said, according to the Guardian. Grushko said NATO has intensified its military drills in Eastern Europe, with about 200 exercises in its eastern member states, mostly in the Baltic and Black seas, Poland and Baltic states. Among “proof” of the “Russian aggression” there have been fake photos of the Russian tanks, which eventually turned out to have been taken in a different place at a different time, a supposed Russian airplane in British airspace, that turned out to be Latvian, and mysterious “Russian submarines” in Swedish waters - which never were found. “Demonizing” Russia plays well into the hands of the military, believes former NATO intelligence analyst, Lt Cdr Martin Packard. Germany does not feel like increasing the military budget at any cost. Minister of Finance, Wolfgang Schäuble, has recently agreed there was a need to spend more on defense, but said that Berlin was not going to do it at least before 2017, Bild am Sonntag reported. Germany has earlier voiced its concern over increasing defense spending to 2 percent of GDP. "Germany believes that the 2 percent requirement is unsuitable as an assessment criterion to determine the loyalty of a member state to the alliance,” a German Defense Ministry spokesman said in the wake of NATO’s September summit in Wales. “We should talk less about percentages of defense budgets and more about smart ways to obtain better capabilities." Together with Italy and Canada, Germany is expected to spend $5.7 billion less on defense in 2015 than in 2014, according to a report by the defense and security think tank, European Leadership Network (ELN). Following talks with NATO Secretary General Jens Stoltenberg on Monday, French President Francois Hollande said Paris currently opposes NATO’s expansion. While bigger NATO members are being frugal in their defense spending, seven smaller ones are significantly boosting military capabilities. The three Baltic states of Latvia, Lithuania and Estonia are in the avant-garde. Others include the Netherlands, Norway, Poland and Romania. The ELN report reveals that Estonia is the only country after the US to meet the NATO target of spending 2 percent of GDP on the military. 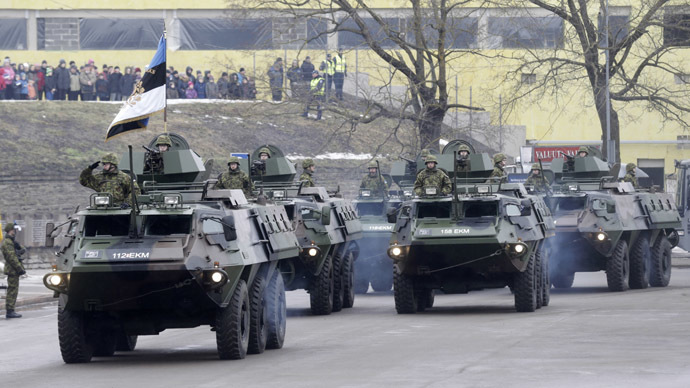 Lithuania meanwhile will see a sharp one-third rise in its defense budget. All of the Baltic States have big contracts for purchasing weapons from their richer NATO allies. Estonia recently negotiated acquisition of the $55 million Javelin anti-tank missile system. It has also signed what’s been described as “the largest procurement contract ever" for purchasing 44 infantry combat vehicles worth €138 million ($154 million) from the Netherlands. Latvia is splashing out more than €54 million ($60 million) on a package that includes 123 British combat vehicles. Lithuania bought a €34 million ($38 million) GROM air defense system from Poland in September. NATO’s rhetoric is not in the least dictated by big business, according to News Junkie Post Editor-in-Chief Gilbert Mercier.